APPROVAL was given for the reconstruction of the Antrim Road, according to the Star in December 1966. The approval was granted in a letter from the Ministry of Development to Lisburn Borough Council. The Ministry said that the scheme was estimated to cost £122,150, excluding land and the grant would be 90%. It was reported that the vesting of the land would be a lengthy process involving 150 or 160 interested parties. It was also hoped that trees could be preserved where post. during the work. IT seems that the high price of energy has long been a problem for people in Lisburn. The credit crunch is affecting many today but in December 1958 the Star reported that gas prices were also deemed to be too high. It was reported that preliminary figures showed that the bulk supply of gas from Belfast for Lisburn would have to be sold at a very increased price and members of Lisburn Urban Council's Gas Committee stated that this was not economic proposition." Are you in the picture? 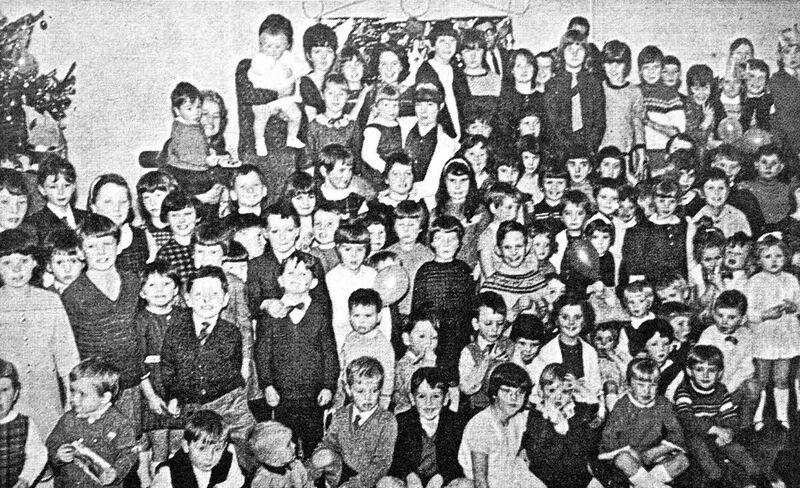 This photograph appeared in the Ulster Star back in December, 1966 and was taken at the RFD, Dunmurry Christmas Party held in the canteen. AT the beginning of December 1958 police recovered a stolen car and three empty money containers following a burglary at Maze Post Office, when a large sum of money was stolen. The car was found abandoned on the Lisburn Road in Belfast, following the theft. In it was a cash register and two tins which had been stolen from the bedroom of the couple who ran the Post Office. The 60-year-old owner of the Post Office told a 'Star' reporter that he and his wife were asleep in the bedroom when the thief, or thieves, entered the room and took away the cash register and the two boxes containing money. "We had been working late that night on the Post Office books," he explained. "We did not go to bed until around lam. "We took the money up to the bedroom with us as usual. "Later my wife heard a scratching noise like rats and I got up and went out on to the landing. I switched on the light but didn't notice anything unusual and went back to bed." The next morning he found that the hall door was lying wide open and a check revealed that the money was gone. Post Office money, postal orders and other documents were in another container in the bedroom which was not touched. Later the police found the stolen car and the money containers, which were empty apart from a few coins. The car had originally been stolen from the Ormeau Road in Belfast, it was reported. IN December 1966 the Star was told that the chances of Hilden Bend ever being removed altogether were 'nil'. The opinion was voiced by the borough surveyor when he was questioned about the corner where five people died the previous summer. However, the Star was also reported that all hope is not gone" as there was still the possibility that improvements will be carried out, with the first steps already taken in a bid to curb the accident rate at this local black spot. Discussions on the possibility of erecting road signs warning motorists of the danger had already been completed by December 1966 and everyone was waiting for them to be erected. The Star published a letter from Rev Bertram Livingston, who said: "Hilden bend has been an accident zone for a number of years. But so far nothing has been done to save lives. The notice that is up indicating a double bend is not correct.... the second bend was removed in 1965. "Must we wait until another life has been lost before our County Council will take the minimum precautions?" Officials of the Borough Council and Lisburn Rural Council were also reported to be concerned. The Deputy Clerk to the Rural Council said: "It is a bad bend, there is no doubt about that. But then we are not a Road Authority. 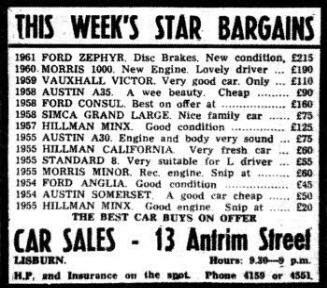 IF you were after a car back in 1966 then you could have driven off with a great bargain - a1955 Hillman Minx for a mere £20. "The matter has been mentioned to the County Council." 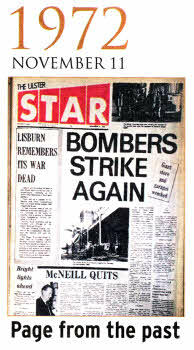 The Star was vocal on the matter and ran an 'opinion piece' of the front page stating "Hilden Bend must go". In the piece the Star stated: "For some people the problem of Hilden Bend is very much to the forefront of their minds. "Years ago when there was more than one tricky corner at Hilden scarcely a court went by without some reference to Hilden Bends. It might have been in connection with careless driving; it might have been in connection with an accident. But the bends were well known to police and magistrate alike. "Hilden Bend is not a sharp corner, but its sweep and the camber of the road make it a difficult one to take - especially for the driver unfamiliar with the locality. "It would seem that if the bend is to go it will require a joint Borough and County Council venture. "The 'Star' feels that such a venture should be undertaken - and without delay. No difficulties are so great that they can outweigh the value of a human life." THERE were celebrations in Lisburn in December 1985 when a Lisburn man became a rugby hero at Twickenham. The Star reported that Andrew Kennedy "calmly slotted" a penalty kick in the white heat of the 'Varsity match at Twickenham. The then 20-year-old Lisburn full back had struck a vital blow for Oxford, who went on to win this famous sporting trial of strength for the first time in six years. Andrew had played for Hillsborough Boys when he was younger and developed his rugby talent at Wallace High School. RESIDENTS in the Ballymacoss area of Lisburn came a step closer to securing their new post office, the Star reported on December 13, 1985. In response to a petition of some 600 signatures, and a letter from Lisburn Councillor, Alderman Ivan Davis, the Head Postmaster announced that plans for the inclusion of a sub-post office in Ballymacoss were being considered. The announcement was said to be a "great relief" to residents who had previously 1 been informed; that the area not eligible for a post office after an application from a local store owner was turned down.